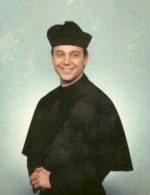 I was ordained into the Diaconate of the Anglican Catholic Church in 1984 and was ordained into the priesthood in 1985, whereupon I became Vicar of St. Augustine’s Parish in Topeka, Kansas. I left St. Augustine’s in 1988 and was transferred to St. Francis Church in Spartanburg South Carolina as Vicar until 1989, whereupon I returned to the Kansas City area and remained serving as interim priest-in-charge at various parishes around the city until I became inactive in 1993. I was born and raised in the Kansas City area, and remain here today. My partner, Bill, of 19 years passed away in 2008 from cancer, leaving me devastated of course and very reclusive until 2012. I then met my current partner, Forrest, We have now been together for over five years and remain committed to each other. My spiritual journey is ongoing and it would be difficult for me to convey my present position on most things spiritual, with the exception that I am open to understanding my life journey and what doors will open for me and for my partner and family. I have so enjoyed being a small part of the EACA family, and have watched closely the love and caring that this church offers not only it’s clergy, but of course it’s communicants and non-communicants as well. I find myself still so attached to the Anglo-Catholic liturgy and practices, although in truth I certainly understand they are not as inclusive as the new liturgies. Preferences I suppose, and nothing more. My best to all of you, my thoughts are with all of you always.